I just found out that a very sweet blogger friend of mine, Sachiko, is from the Miyagi prefecture, one of the areas that was hit very hard by the earthquake and tsunami. I just can't imagine how heartbreaking it would be to see that happen to your hometown. Although, Praise God, her family is all OK. I can hardly breath when I think about how terrible it must be for people over there right now. Please take a moment to visit Sachiko's blog and read her post about it, I'm sure she needs all the encouragement she can get. So HAPPY to hear that your friend is safe and protected! I am glad to hear that your friend is Ok. I can't imagine being in a situation like that. I am praying for everyone affected by this horrible disaster. I read that on her blog too. I am so glad her family is ok. I have heard from friends over there as well. 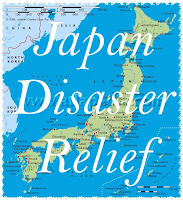 But I continue to pray for the families there and the relief efforts. I was just telling Adam about Sachiko and her family (like, right now, as I clicked to your blog). Goodness gracious, so rough. Thanks for putting this on here, Disney! Oh, Disney, thank you so much for this wonderful post. It means so much to me. By myself, I feel useless or so small. With wonderful people like you I feel like I can make a difference. We were able to Praise God this week for the same reason, my inlaws, who i love so much live in Japan (as do some of my old youthgroup kids, we're military, so we have fam and friends everywhere) and like you said, PRAISE GODthey are all safe!! they are also out of harms way with the neuclear stuff too, my mother in law said even though its such a disaster its wonderful to see all the people coming together and helping each other... my in-laws are military retiree so they still work with the military out there, and she said that the military is donating allot and volunteering so much, when she went to help get things together for the relief efforts she kinda felt in the way a bit there were so many people there!! We keep praying for the people there, and we pray that God will comfort them in this tragic time.